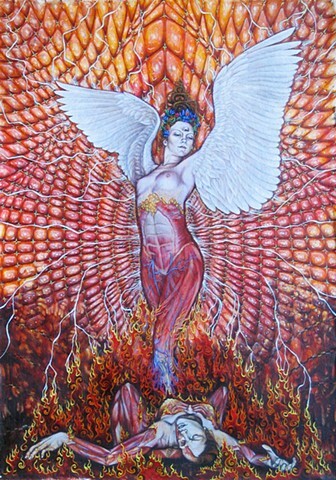 The Phoenix is a character in our collective unconscious and one that has found a home throughout time in every culture’s myths, legends and folklore. Symbolically, it relates a tale of death and rebirth, a theme dating as far back to the very beginnings of conscious mankind, transforming into an essential role in all of the major religions and ideologies and even sustaining itself amongst popular culture. Just as the phoenix rises from the ashes, renewed and shining as before, we can harness opportunities in our lives that seem bleak, dark, and draining to turn it around and rejuvenate ourselves, become again the person who we really are. We can decide that today is the day to brush off the staleness and dust and immerge reborn, blinking as we step into the sunlight of a new day. This painting is very much a self portrait not only in appearance but in theme as well. My life is dictated by powerful moments and periods of death and rebirth where I experience both conditions very poignantly. I depict myself burning and disintegrating below and from those flames i am reconstructed again, first through bone, then arteries and veins, then layer by layer of muscles and then skin. My hair forms the crown of the White Tara, the Buddhist Mother Goddess of Compassion. I depict myself as white as well for the many references the color white has, purity, rebirth, renewal, divinity, as well as the color of a freshly blooming lotus. The wings reference birds in their association with the spiritual quest. Throughout time they have been used as symbols for the soul, for out higher selves, and for our quest to transcend. There is also a very clear angel reference for those of us in the Western mindset. It all simply means that each rebirth incarnation manifests in a slightly higher level of awareness and accomplishment and that the aspirations for greater knowledge and broader spiritual growth are inherently present. The painting is done on canvas and then I sewed the crochet lace detailing onto it. The crochet is hand done by me, of course. The tapestry element of the painting harkens to the Tibetan Thankga paintings which are objects for meditation visualizations as well as maps of visionary journeys taken by the meditator personally. This condition holds true for my own painting which can be looked at as an inspiration along the path as well as my own journey in this life.